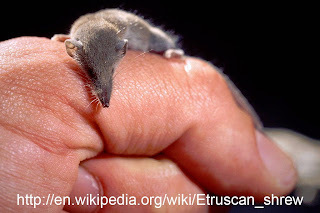 Suncus etruscus is commonly known as the Etruscan shrew. It is officially the smallest mammal in the world by body weight, weighing on average 1.8 grams and at most 2.5 grams when fully grown. Its full grown body length can be as little as 3 cm excluding the tail. 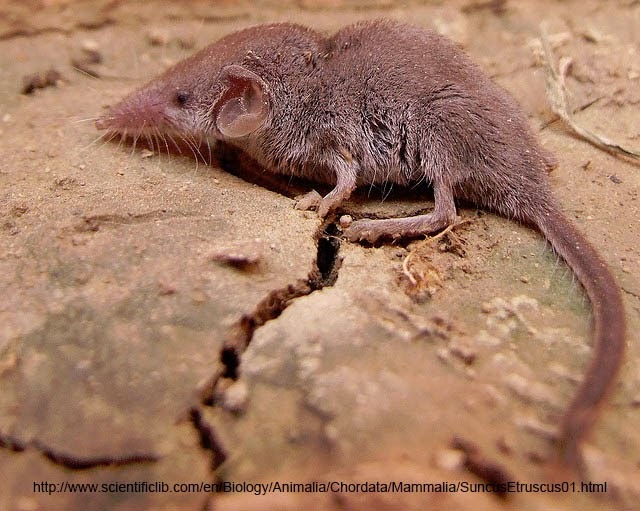 These tiny shrews expend a lot of energy keeping themselves warm due to their high surface area to volume ratio and can eat up to twice their body weight each day just to stay alive. Although they are called Etruscan, their range extends well outside Tuscany with a patchy distribution stretching across south and Southeast Asia the middle east and the Mediterranean.